In our Swapit beta 9 we introduced sharing to Facebook groups. It is dead simple and can be done within a few seconds. Now, we have added more groups to our list of supported Facebook groups. In total, you can now easily reach all members of all groups swapit integrates with. As of today, that totals up at around 221,000 people. While those folks are not necessarily well targeted, as they include just everyone in those groups, reaching out to them still allows you to spread about the item you are selling my a multitude! We initially launched our Facebook group sharing with just 3 hand-picked groups that allowed you to reach 15,000 people. We have now extended that to a total of 13 groups with a much larger member base. We have always believed to make it as easy as possible for buyers and sellers to find each other. One piece in the puzzle to accomplish this, is our “post once, reach many” approach. In terms of making your sale fast, it is more likely to find a buyer through Swapit faster than through any other app, website or social media. Just because Swapit uses its unique technology to pro-actively reach out to potential buyers who are nearby right now. However, we also acknowledge that we all need to save as much time as possible and we want to be as productive as possible. Therefore, we believe, we can make everyone’s life easier by allowing such quick and easy shares to Facebook. As a seller, you only need to take your photos once, enter the title / description / price once and then hit “publish”. This is a much more efficient way of selling items, than any other platform or app we know about. We are currently working on getting more Facebook Groups on board, to reach roughly 500,000 members that can be addressed within a few seconds. We believe, from a seller’s perspective, this is the most attractive, most efficient and most convenient way to post items for sale. Stay tuned for new updates coming to Swapit soon! FbStart is a new program from Facebook designed to help early stage mobile startups build and grow their apps. Again, we are absolutely delighted to be part of the FbStart eco-system and are looking forward to work together. We have already integrated Facebook into Swapit. We are looking to do much more on that front and revolutionize the way people trade pre-loved items nearby. P.S. : Just in case someone is interested, this is the information I left the RISE conference this year where the FbStart folks talked to me. Seems it worked out to follow up on it. 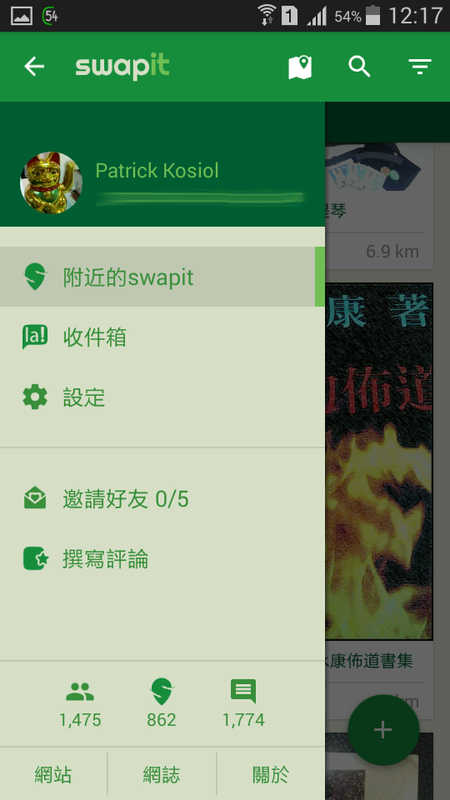 We have just launched the swapit beta 8 on Google Play. If you don’t have it yet, just go to http://get.swapit.la and download it now. The most important new feature in beta 8 is the ability of sharing your swapit posts on your Facebook timeline. This allows you to reach your social circle on the most popular social network out there. To date, Facebook has 1.23 billion monthly active users world-wide and 4.4 million users in Hong Kong alone. 3.1 million Hongkongers log on to Facebook every day, spending an average of 30 minutes during each visit. That being said, Facebook was on our number #1 priority list of social networks to integrate with swapit. We have been working hard to get this done smoothly and in the most convenient, but non-distracting way. Let me demonstrate how it works. The screen shot on the right shows how the posted item looks like on your timeline. It’s simple, but with all the important information you need to present. If a user has swapit installed on his or her device, a click on the link will open swapit and direct him or her to that particular item. If swapit is not installed yet, he or she will be prompted to download swapit. As you can see, we have made it easier to identify the product’s condition as well as the product’s category. The “show interest” button has also been moved to a more prominent location, allowing interested users to easier identify the next action they can take. Furthermore, the latest beta of swapit comes with many other small improvements and bug fixes that make the swapit experience more smooth. Stay tuned for the next beta coming your way this week! Don’t have swapit yet? Go to http://get.swapit.la and download it now! Two weeks ago we published our first research infographic on trading activities in buy and sell groups on Facebook and shortly after the research results of week 2. Today it’s time to look at the results of week #3 and combine all three weeks into one result set. If you have seen our previous infographics, you will find this week’s one to be quite different, but yet similar. So over this very short period of 3 weeks we saw the number of items that are being traded were stable. There was a continuous influx of new items being posted and the average price was more or less stable. The number of total inquiries increased correlated directly with number of members and items posted in such Facebook groups. This is a very encouraging of an active trader market of pre-loved items. Since we launched our public beta of swapit about 2 weeks ago, our user base is growing rapidly as well. Our goal is to reach a widespread adoption like the those Facebook groups by providing a much better user experience to buyers and sellers – allowing them to trade easier and quicker. The content in this article and its infographic is based on research done by Kevin Hsu of the swapit team. Growing Buyer Liquidity for the Swapit Marketplace – Here is what we NOW focus on! I just read this great article by David Norris titled “Online marketplaces: What kind of liquidity do you need to grow?” If you are building a marketplace like we do with swapit, I strongly suggest you reading David’s post. Buyers to buy those items. I totally agree with all of David’s points in terms of creating and sustaining such liquidity, but there are some points which I learnt from David’s great article. We at swapit have been very active to reach out to our target audience. We use various channels to do that: Twitter, Facebook, YouTube, online forums, groups, live events, pitches, conferences, offline lead generation, guest columns / media, networking events, and so on. Buyers won’t visit a marketplace if there is nothing to buy. Sellers won’t sell at a marketplace unless there are buyers. One thing is for certain; having a large consumer base is a good reason for sellers to want to use the service. The other way around is less certain; just because you have a large number of products on the shelves doesn’t mean people will come. So while we were going very directly after our target audience – we were always contemplating whether to focus more on the buyer or the seller-side of that audience. Having read through many of David’s examples, taking into account his experience, looking at our experience at S4BB Limited in terms of building mobile apps for over a decade; building, publishing and running mobile retail apps for over 3 years; we decided to shift our focus of outreach more strongly towards the buyer side. Some changes in that respect, are very simple actually. In the end it is all about communication and how we present swapit to our target audience. So instead of using a phrase like “Buy and sell second hand items nearby!” we are now using something like “Find pre-loved quality products nearby!“. This addresses buyers directly and actually leaves sellers completely out. Again, I absolutely agree with David that we need to go after our buyer audience much more strongly than our sellers. To be honest, we already have some rather active sellers on swapit. (If you’re a seller and read this post: Thanks a lot for your participation!) Every day we see new items being posted for sale. In the end we also need to keep in mind that people who are buyers on swapit are also potential sellers, and every so often, such buyers actually turn to sell some of their pre-loved items too. Sometimes that’s even an item they previously bought on swapit. So by attracting more and more buyers to swapit, we know for sure that we are also growing our seller-base. Hence, a strong focus on attracting more buyers makes a lot of sense and we will go after that even more refined target audience. I will keep you posted here on how the results are. You want to give swapit a try? Just go to http://get.swapit.la and download the app. Last week we published our first research infographic on trading activities in buy and sell groups on Facebook. Today it’s time to look at the results of week #2. If you have seen our last infographic, you will find this week’s one to be very similar. So over this very short period of 1 week we already saw an increase in the number of items that are being traded while the average price fell slightly and the number of total inquiries increased moderately at an increasing number of members in such Facebook groups. These findings look very promising and we are confident our swapit will app will penetrate that market with huge success. Since we launched our public beta a week ago, our user base is growing rapidly as well.